One of the worst maritime disasters in U.S. history happened on 24 July 1915, causing the loss of more than eight hundred lives. Yet this tragedy is little known today. Between Monday 15 April 1912 and Friday 7 May 1915, three enormous maritime disasters rocked and stunned the world. The two of these bracketing the trio are quite well known, being the subjects of many works of history and fiction in books, plays, and movies: RMS Titanic and RMS Lusitania. The middle one of the trio, RMS Empress of Ireland which sank after being rammed on 29 May 1914, is nowhere near as famous these days as its bookends, but it was every bit as shocking and stunning a disaster. Each of these catastrophes caused the loss of more than a thousand lives; each was probably avoidable. In the aftermath of the wreck of Titanic, new regulations were quickly put into place to ensure adequate life boats, but the speed with which Empress and Lusitania sank precluded any effective deployment of life saving equipment. 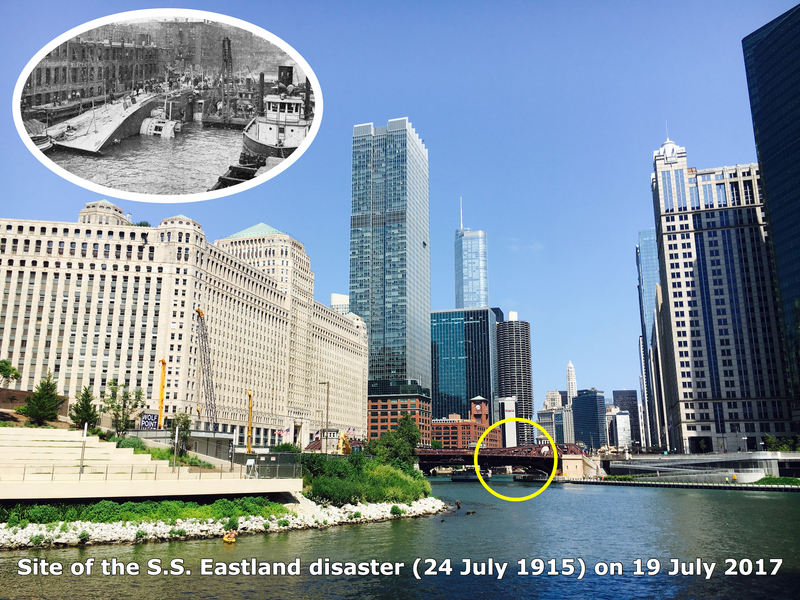 It is profoundly and tragically ironic that the loss of S.S. Eastland in July of 1915, less than two months after the sinking of Lusitania, may have been precipitated by the vessel’s compliance with the requirement for more lifeboats. Eastland was a Great Lakes steamer as large as an ocean liner. Launched in 1903, Eastland early on revealed a tendency to list excessively because of a somewhat top-heavy design. To help avoid this characteristic, the ship adopted rules regarding how many passengers she could board, and how many could be on the upper decks at any given time. These measures permitted the ship to ply the lakes for a dozen years without major incident. However, after the new regulations of lifeboats following the loss of Titanic, Eastland’s tendency to list returned quite noticeably. The extra life-saving equipment made the upper decks even more top-heavy. On 24 July, Eastland had been chartered by Western Electric Company to ferry employees to a company picnic in Indiana. The ship was docked on the south bank of the Chicago River between LaSalle and Clark Streets. The employees began boarding the vessel about 6:30 AM; within forty minutes the ship was at full capacity of about 2,500 passengers. To take fullest advantage of the “pleasure cruise” to the picnic, many passengers congregated on the upper decks. Several witnesses who observed the vessel from shore recalled that the ship seemed to have developed a distinct tilt toward its port, riverward side. Something seems to have attracted the attention of a large number of passengers, for at about 7:30 AM, hundreds of passengers began crowding to the port side. There was no crash, no explosion, no fire, indeed, nothing especially dramatic at all; Eastland simply slowly and quietly capsized into the shallow water of the river. Another ship nearby, Kenosha, immediately maneuvered to start rescuing passengers, but many were trapped below decks. Though the emergency response was immediate, some 844 passengers and crew perished. The city and the nation reacted with shock and horror. The local papers immediately passed judgment as to responsibility for the disaster. Western Electric committed $100,000.00 to the efforts to care for survivors and to recover victims’ bodies. Naturally a spate of legal actions were undertaken. Famous lawyer Clarence Darrow represented victims in one action in Federal court. Ultimately, the courts found neither negligence nor malfeasance in the disaster. Chicago journalist Carl Sandburg – later renowned as one of America’s great poets – wrote a scathing commentary on the disaster for the 15 September 1915 edition of the International Socialist Review. He later penned a poem to commemorate it as well. The poem’s incendiary tone ensured that it would not be published until 1993. Last week I was in Chicago, and I walked right above the site of this disaster, and motored past on a river tour boat.